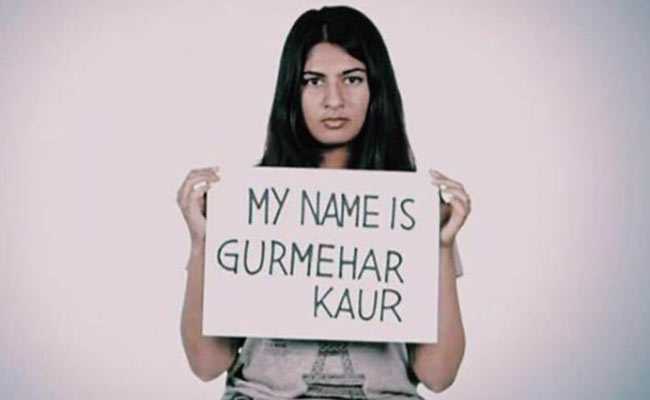 Last year, Gurmehar Kaur was trolled online for her stand against campus violence and for appearing in an earlier recorded video in which she was seen holding a placard that read, "Pakistan did not kill my father but war did". Gurmehar Kaur said that women should occupy the social media space to make it more "safe"
After having been at the receiving end of online abuse, and her posts being reduced to memes, student activist Gurmehar Kaur said on Wednesday that the "hate" would never match to the level of "love" and support she received from people through social media. "Everyone wants to know about the gossipy bit 'How did you feel', 'Were you scared when that happened'. But nobody asked me how many friends I made, how many women stood up, how many messages of solidarity I got," Ms Kaur said. "Hate comes in a very orchestrated way, it is a 9 to 5 thing with the hate. But the love I got is impossible (to explain). I don't think I would have survived if it wasn't for the love of the people that I received throughout," Ms Kaur said, while speaking in Delhi at the 6th edition of the annual SHEROES Summit - 'Building Communities'. Describing social media as a "public space" similar to a street, Gurmehar Kaur said that women should occupy this space to make it more "safe" and not shy away from it for the "fear of trolls". "Everyone is online, everyone is putting up their opinion, it is not a virtual world anymore it is a public space. We need to occupy these spaces so that many young girls sitting in a tiny town, who have an idea or a thought, can put their opinion out there without any fear," the 21-year-old student activist added. Gurmehar Kaur, who made it clear that her activism didn't start at once after she joined Delhi University, said speaking up has been important for her since the school days. "Speaking up is important because when you speak up, face the brunt of it, and survive it... you then give courage to at least ten other women to speak their mind. "They say 'she spoke up, she survived the distress, now I think I can also do that.' This is how they get the courage to raise their voice," she said. At the SHEROES Summit, an initiative by a women's online community platform, diverse women professionals and businesses come together, with choices at the center of it all.